You are receiving this newsletter because you are an active Accredited Estate Planner® designee and/or member of NAEPC through your estate planning council's affiliation. Membership offers many perks and this newsletter contains an overview of those opportunities. Read on for more information. Editor's Note: Forget "Must Love Dogs" - Go with "Must Love DSUE"
A note about this program: Marty and Steve believe that the American Cancer Society has made, and will continue to make, incredible efforts to both defeat cancer and enrich the lives of those who face it. All profits from this special webinar will go to The American Cancer Society. The fee to participate is $129. This program will cover: why and how to structure irrevocable trusts to include an array of non-traditional provisions; what to do about GRATs in an uncertain environment; why and how to repurpose existing irrevocable trusts and transform frogs into trust princes with via decanting or a non-judicial modification; how to address a looming problem too few planners are taking action on - financial conflicts for aging clients; why your client should be re-considering gift provisions under existing durable POAs and revocable trusts; trust protector; and Ethics Opinion 477. In this practical webinar you will learn why teaming is essential for multi-generational legacy planning, and how teaming plays out in three business models: Family Office, Private Bank, and Best of Breed Teams of Independents. Join this program to learn how to position your practice for success in this rapidly changing legacy planning landscape. The 54th Annual NAEPC Advanced Estate Planning Strategies Conference is scheduled from November 15-17, 2017 in New Orleans - don't miss your chance to experience this exceptional event! The full registration brochure, online reservation links, and general information can be found on our website. It's not too late to attend; register by October 31st to avoid the late fee! The annual conference has truly become the "go-to" event for estate planners from across the country. The exciting line-up of nationally-recognized speakers coupled with a fabulous location, The Roosevelt, our plush host hotel, and incredibly competitive registration fees, make this signature annual event one that is not to be missed. To learn more about the conference, including the full list of speakers and topics, registration fees and packages, and to download the conference brochure, please visit our website. We are grateful for the support of the conference sponsors and exhibitors as their participation allows us to provide attendees with the experience the annual conference has become known for, and also gives attendees access to new resources during the three days of exhibit hall hours. Sponsorships and exhibit booths are still available! Review the sponsor kit or contact Ed Socorro at ESocorro@NAEPCmarketing.org or 312-600-5303 for more details. Smead Manufacturing Company, a leader in office filing products and records management systems, was established in 1906 in Hastings, Minnesota. Smead is a privately held, certified Women's Business Enterprise (WBE) offering thousands of organizational products for use in the home or office. For more information on Smead's high-quality organizational products, including hundreds of products made in the USA visit www.smead.com. 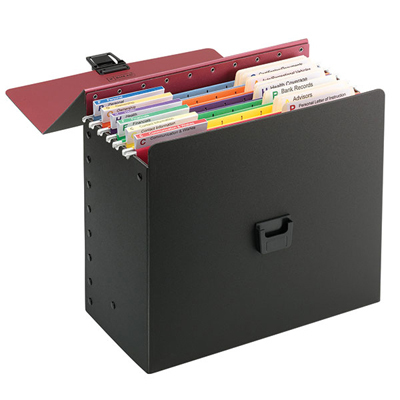 For more information on the Life Documents Organizer Kits, including a product overview video and assembly instructions, please visit the Smead ecommerce store at www.myorganized.life. NAEPC members receive a 20% discount when using the discount code found in the NAEPC members-only area. Qualified professionals can achieve an accreditation that acknowledges their experience and specialization in estate planning. Simply put, the Accredited Estate Planner® designation means "I believe in the team concept of estate planning." Awarded by the National Association of Estate Planners & Councils to estate planning professionals who meet special requirements of education, experience, knowledge, professional reputation, and character, the AEP® designation helps both clients and colleagues understand your belief in, and dedication to, the team concept of estate planning. The Accredited Estate Planner® designation is available to professionals in the following disciplines -accounting; insurance and financial planning; legal; philanthropy; and trust services - who hold a gateway credential of CPA, CLU®, ChFC®, CFP®, CPWA®, CFA, MSFS, MST, JD, CAP®, CSPG, or CTFA and meet stringent qualifications at the time of application and commit to ongoing continuing education and recertification requirements. With a minimum of 5 years of experience, the designation is available after taking two courses through The American College. For those individuals who have 15 years of experience or more, one may choose to be exempt from the required graduate-level courses in estate planning*. *Exceptions apply, please contact the NAEPC office to learn more. We are very excited to announce that Jonathan G. Blattmachr, Esq., AEP® (Distinguished), a 2004 entrant into the NAEPC Estate Planning Hall of Fame®, will receive the NAEPC Hartman Axley Lifetime Service Award on November 17, 2017. Created to honor those who have been highly active in the estate planning community and crucial to the development of the association, the award was named after the "heart" of the NAEPC, Hart Axley, and will be presented to Mr. Blattmachr at the 54th Annual NAEPC Advanced Estate Planning Strategies Conference. Congratulations, Jonathan! It is very hard to believe that both the annual conference and the end of my presidency are so near. We are very excited to be returning to New Orleans (the hometown of NAEPC's immediate past president Larry Lehmann) ten years after our last visit for the 54th Annual NAEPC Advanced Estate Planning Strategies Conference. Our entire board is hoping that you are planning to attend to gather knowledge and network with your peers in "The Big Easy." We believe that the ideas shared this week will be valuable to your professional practice as we continue to work to create ONE NATIONAL NETWORK of estate planning professionals through the affiliated local estate planning council system. NAEPC continues to grow and break records by increasing the numbers of affiliated local councils, conference and webinar attendees, and Accredited Estate Planner® designees. This year we focused on furthering previously-adopted goals and had many committees working to provide new or enhanced programs and services. This is all accomplished because of the tireless hours our board of directors and non-board committee volunteers devote to help NAEPC thrive. For that, I thank them. Without the support of this incredibly talented group of volunteers, we could not offer the exceptional programs and services available to you on a daily basis. As you start to think about your activities for next year, please consider volunteering with NAEPC. It has been my distinct honor to have served you and this organization as President during the past year. Lifelong friendships have grown because of my participation in NAEPC and I look forward to continuing those relationships in the coming years. Estate planning? Let's see if we can break that term down to common denominators: I am a CLU®, ChFC®, AEP® and a past president of NAEPC, yet I do not claim to be an estate planner. Yes, I give my clients a few ideas to consider, but my primary functions are to get those clients in front of the other members of the team and then to provide funding for whatever liquidity is needed in the plan; nothing does that as well as life insurance.